All competition area’s will be equipped with video replay and Daedoelectronic body protectors and headgear. 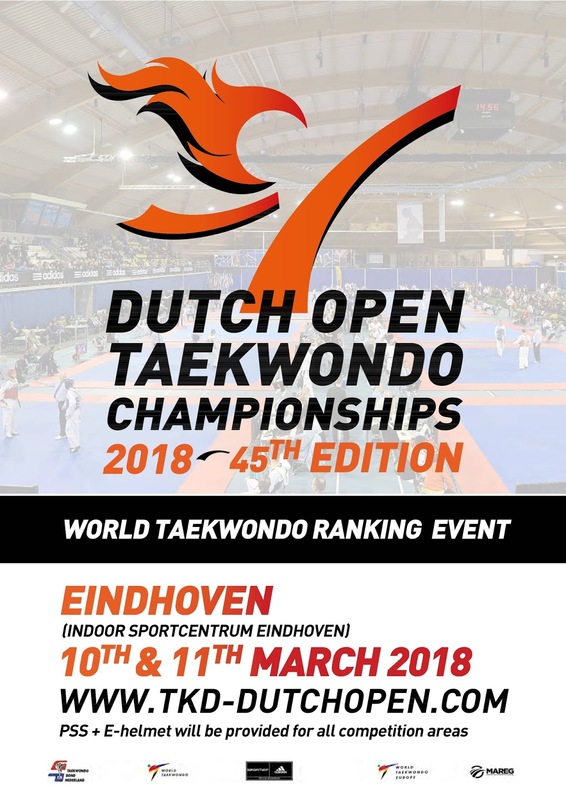 The 45th Dutch Open Taekwondo Championships 2018 will have the best referees in order to guarantee maximum transparency, fair play & impartiality for the athletes. Please mark our event in your calendar and make sure not to miss this highlevelquality championship. Our professional organisation team is working hard to make this event successful! If you need any assistance, please do not hesitate to contact the organisation team. We hope that you and your team will participate at the Dutch Open 2018 andwe are looking forward to welcome you in the city of Eindhoven. Juniors Male and Juniors Female. Seniors Male and Seniors Female. Age : Age categories according to WT-categories accept for the cadet division. (Juniors born in 2001 compete as a junior or as a senior.